CONTEXT: Information on childhood poisoning in the developing world, including South Africa, is scarce, despite its contribution to morbidity and mortality. METHODS: Cases were identified by review of the RCWMCH case records. RESULTS: Of the total incidents (N=2 872), paraffin (kerosene) was the commonest agent (n=692, 24%) with 124 poisonings including two deaths. Drugs were the most common toxin group (n=988, 34%), including 139 single-drug poisonings with 5 deaths; 4 associated with traditional medicine use. Household cleaning product incidents (n=302, 10%) resulted in 29 singleproduct poisonings with no deaths. Pesticide incidents (n=311, 10%) included 6 deaths; 203 (65%) incidents were due to organophosphates or carbamates. The suburban distribution of the main toxin groups varied. Comparing 1987 and 2008, the number of incidents decreased from 1 116 to 447; drug and paraffin incidents decreased respectively (from 673 to 150 and from 332 to 87), household cleaning products and cosmetics increased (21 to 69) and pesticide incidents increased (7 to 69). 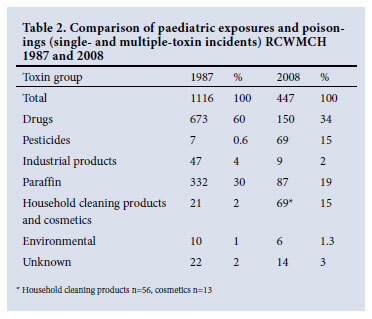 CONCLUSION: Despite a decrease in the overall number of incidents over two decades at RCWMCH, paraffin and drugs remain the principal agents responsible for paediatric exposures and poisonings, with increasing incidents due to household cleaning products and pesticides. Identification of these toxin groups coming from specific suburbs allows for targeted prevention initiatives. In contrast, paediatric poisoning incidence in developing countries is poorly documented3,7,8 and most reports are based on hospital admissions.3,7,8-10 Agents such as paraffin (kerosene), drugs, household cleaning products, pesticides, traditional medicines and environmental toxins are the most common culprits and frequently cause severe outcomes.3 There are few data on the changing trends in incidence and causative agents for developing countries. This was a retrospective review of children presenting to Red Cross War Memorial Children's Hospital (RCWMCH) with toxin exposure or poisoning between January 2003 and December 2008 and a comparison with the pattern of poisoning seen at the hospital in 1987.13 For many years, the Poisons Information Centre (PIC) at RCWMCH has recorded information on all children who present to RCWMCH with suspected or confirmed exposure to a toxin or poisoning. Cases are identified weekly from the attendance registers of the outpatients department and the admission and nursing registers of all the hospital wards. Case notes are reviewed, and if confirmed as an incident (by a history of exposure, clinical presentation or toxicological confirmation), the case is recorded in a Clinical Poisonings Database. Data were extracted from this database, including hospital folder number, age, address, season of presentation, length of hospital stay, causative agent, route of exposure, clinical severity and outcome. Children who presented for multiple unrelated incidents of exposure or poisoning were analysed for each individual incident. Where they presented with exposure or poisoning due to multiple toxins within the same incident, the case was analysed as one incident with each toxin captured. Clinical severity was recorded according to the poisoning severity score (PSS):14 0 = none, no symptoms or signs related to poisoning; 1 = minor, mild transient and spontaneously resolving symptoms; 2 = moderate, pronounced or prolonged symptoms; 3 = severe, severe or life-threatening symptoms; 4 = fatal, death. In this paper, the word 'exposure' refers to those incidents with PSS 0 - 1, and 'poisoning' to those with PSS 2 or more. The distribution of length of hospital stay was calculated for poisonings only.  dhandyman and industrial products: fuels (excluding paraffin), paints, glues, dyes, wood products, batteries, refrigerants, solvents, etc.  dpesticides: rodenticides, insecticides, fungicides, moth repellents, herbicides, fumigants. In this paper, the definition of 'unknown' finds several interpretations depending on its context. Firstly, patients who presented with a history of no known exposure, sudden onset and spontaneous resolution of symptoms, where there was no infective or traumatic cause, were classified as poisonings. These were recorded as 'unknown' toxin in the overall number of incidents. Secondly, within the groups such as drugs or household cleaning products, there were 'unknown' products. In this context, there was a history of exposure to a toxin, which was identified by its intended use only and exact identification by name was not possible. These were recorded as, for example, 'unknown' drug or cleaning product. Thirdly, if an agent was known to be an anticonvulsant for example, but the specific name unknown, they were included in the anticonvulsant category as 'unknown' anticonvulsant. Permission to perform this study was granted by the Faculty of Health Sciences Human Research Ethics Committee (HREC REC 490/2008) and by the School of Child and Adolescent Health Research Committee, University of Cape Town (Ref 430/08). There were 2 872 incidents of toxin exposure or poisoning with 908 (32%) presenting directly to RCWMCH and the others referred. They involved 2 832 patients; 38 with 2 separate incidents and 1 with 3; 2 539 (88%) were under 6 years (median 24 months, 90th centile 85.3 months, range 0 - 520 months) and 1 571 (55%) male. Ingestion was the route of exposure in 2 577 (90%) of all incidents. Only 60 (2%) were non-accidental; 50 of these were attempted suicides (median age 149 months, 90th centile 155, range 111 - 169, 35 (70%) female). The 2 872 incidents involved 2 853 toxins, the main toxin groups being paraffin, drugs, household cleaning products and pesticides (Table 1). 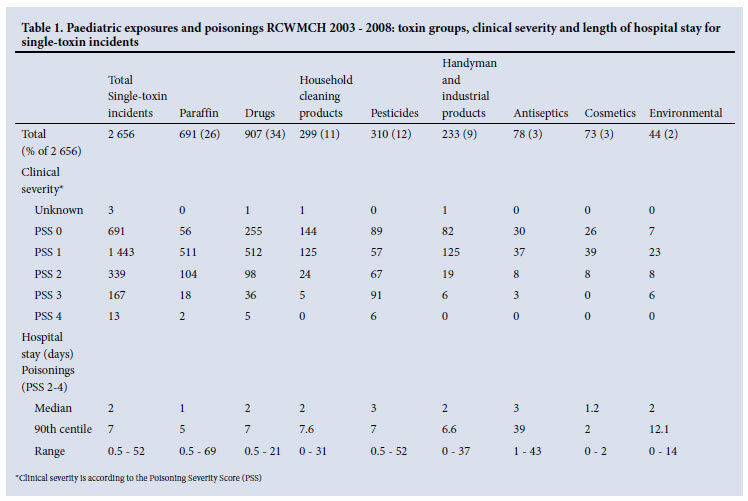 In 2 656 (92%) incidents, a single toxin was implicated (Table 1) and in 85 two or more toxins. The overall number remained fairly static from 2003 to 2008 (Fig. 1) with a summer peak from October to February. Between 2003 and 2008, drug incidents decreased, paraffin incidents increased until 2006 and subsequently decreased, household cleaning product incidents remained static and pesticide incidents doubled (Fig. 1). The suburban distribution of the main toxin groups varied. Large proportions of paraffin and pesticide incidents came from the suburbs Khayelitsha, Philippi, Gugulethu, Nyanga and Langa (paraffin n=615, 89% and pesticides n=186, 60%) contrasting with those from geographically adjacent suburbs Mitchell's Plain, Athlone, Manenberg, Hanover Park and Bonteheuvel (paraffin n=31, 4% and pesticides n=46, 15%). The converse was shown for drug incidents where the Khayelitsha group (n=276, 28%) had fewer incidents than the Mitchell's Plain group (n=428, 43%). The two groups were equal with regard to household cleaning product incidents (Khayelitsha group n=107, 35% and Mitchell's Plain group n=103, 34%). Paraffin was the most common agent with 692 (24%) incidents. In 691, only paraffin was involved. The remaining child had a vague history of paraffin ingestion and signs of a dystonic reaction due to an unknown toxin. There were 124 paraffin poisonings with 2 deaths; one died of aspiration pneumonitis and the other, an HIV-positive patient with extensive chemical pneumonitis, developed septic shock. Drugs was the most common toxin group (n=988, 34%); in 907 incidents, a single drug was involved. Of these, antipsychotics and antidepressants were the most common subgroup (n=272, 28%), followed by flu medications and antihistamines (n=77, 8%), unknown drugs (n=80, 8%), antihypertensives and diuretics (n=70, 7%), analgesics (n=71, 7%), anticonvulsants (n=56, 6%), topical agents (n=46, 5%) and vitamins and minerals (n=43, 4%). The most common drug classes for single-drug incidents were phenothiazines 84, tricyclic antidepressants 83, butyrophenones 74, paraaminophenols 62, benzodiazepines 46, carbamazepines 36, iron compounds 35, methoxybenzamides 27 and xanthines 27. There were 139 single-drug poisonings (Table 1); 7 tricyclic antidepressant incidents, 7 carbamazepine incidents, 2 of 8 salicylate incidents and 3 of 18 traditional medicine incidents formed 53% of the 36 severe single-drug poisonings. There were 5 deaths: 4 associated with traditional medicine ingestion and 1 following aspirin ingestion. In all 4 traditional medicine cases, sepsis was a likely additional factor: one used traditional medicines to 'ward off evil spirits' and had suspected sepsis; another used traditional medicines for 'winds' and developed haematemesis, malaena, a deranged clotting profile and necrotising enterocolitis; a third had preceding diarrhoea and vomiting and autopsy revealed severe necrotising bronchopneumonia and Waterhouse-Friderichsen adrenal lesions with viral inclusions; and a fourth, who had been given traditional medicines for constipation, was treated in hospital for malnutrition, Gram-negative sepsis and dehydration, but died at home after discharge. The death following aspirin ingestion was a 7-week old previously well infant who was given half a Disprin (aspirin) 'because he was crying'. The child developed salicylate poisoning and autopsy revealed features similar to Reye's syndrome. In 80 of the 988 drug incidents, more than one drug was implicated, and in one further incident, a drug and household cleaning product was involved. The 42 children with multiple-drug poisonings had a median stay in hospital of 2 days (90th centile 8.8, range 1.0 - 10) and there were no deaths. Pesticide incidents (n=311, 11%) included 6 deaths (Table 1); 203 (65%) of all pesticide incidents were due to organophosphates or carbamates. There were 302 (11%) household cleaning product incidents. In 299, one household cleaning product was involved, in 2 incidents two household cleaning products, and in 1 incident a household cleaning product and drug. The most common causative agents for all household cleaning product incidents were bleach (n=180, 59%), oven cleaner (n=29, 9.5%), drain cleaner (n=28, 9%) and floor cleaner (n=18, 6%). 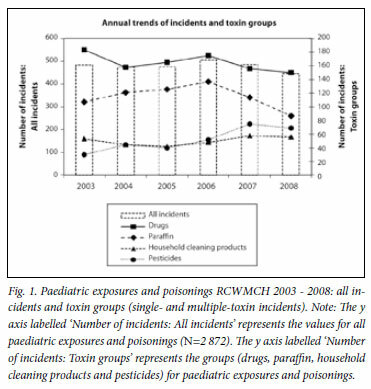 Of the 30 household cleaning product poisonings, 29 were single-agent poisonings (Table 1). There were no deaths. The 233 (8%) incidents involving handyman and industrial products were all single-agent incidents. There were 110 due to mineral spirits, 29 to glue, 14 to petrol or diesel, 13 to battery acid and 9 battery ingestions. The 110 mineral spirit incidents included 12 poisonings with a median stay in hospital of 2.5 days (90th centile 6.8, range 1 - 9). The 73 (2%) cosmetics incidents, all by single agents, included 48 due to hair straighteners. Antiseptics (n=78, 2%) were all single-agent incidents. Of 46 incidents due to potassium permanganate, 8 poisonings included 3 with severe corrosive injuries (PSS 3) with 1 patient requiring a tracheostomy and feeding jejenostomy. There were no deaths. All environmental toxin incidents (n=44, 1%) involved only one toxin. Plants contributed 12 incidents and scorpions 2. Of the 12 spider incidents, 2 were due to widow/button spiders (Latrodectus genus); both envenomations required antivenom administration. Of the 5 snakebite incidents, two were berg adder (Bitis atropos) poisonings with predominantly neurotoxic symptoms; one was either a berg adder or Cape cobra (Naja nivea) envenomation with neurotoxic presentation and therefore given antivenom; and one suspected Cape cobra poisoning was successfully treated with antivenom. The toxin was unknown in 131 (5%) incidents; 49 presented with extrapyramidal dystonic reactions responsive to tropine alkaloid (biperiden) management. Of the 1 116 patients seen in 1987 352 (32%) were admitted, while in 2008 334 (75%) of 447 incidents required admission. There were 10 incidents in 1987 and 11 in 2008 involving multiple toxins. Figures from 1987 and 2008 reveal changing trends in the major toxin groups (Table 2). However, no major change has occurred in the drug subgroups as antipsychotics and antidepressants remain the most common subgroup over the past two decades with a slight increase in the number of antihypertensive and diuretic drug incidents in 2008. The past two decades have seen a decrease in the overall number of incidents of paediatric exposures and poisonings seen at RCWMCH. This may reflect the South African National Department of Health's policy since 1994 to decentralise services to primary healthcare facilities, thus reducing the number of presentations to hospital. This view is supported by the increase in the proportion of hospital admissions compared with prior decades as only the sicker patients should be referred. The true incidence of exposures and poisonings within the Cape Town paediatric population for the two study periods cannot be calculated. A true estimate requires inclusion of children presenting to public and private facilities and this information is not available. Furthermore, population figures for these time periods are not comparable as census data are limited, particularly regarding children. However, it would be reasonable to assume that the provincial trend of increasing numbers of children over the last decade (1997 - 2007)15 also occurred between 1987 and 1997. Although we cannot establish the absolute incidence of paediatric poisonings, it is highly probable that there has been a decrease: the numbers of poisonings presenting to the hospital in 1987 and 2008 were similar despite a population increase. The study reveals similar trends in causative agents over both the two decades and the more specific 6-year period, which are comparable with trends in other developing nations.7,9,10,16-18 The growth in the number of pesticide incidents since 1987 is alarming with marked morbidity and mortality demanding advanced resources.7,8 Incidents due to household cleaning products have grown over 20 years, but are possibly reaching a plateau. Despite the considerable decrease in incidents due to drugs and paraffin, they remain responsible for almost 60% of new presentations. The incidence of paraffin poisoning in South Africa, extrapolated to be about 40 000 -60 000 cases annually,19 is probably an underestimate as a result of some patients not presenting to hospital and incorrectly recorded deaths. Although the benefits of simple preventative measures such as child-resistant containers and the cost burden of hospital admissions have been demonstrated,20,21 paraffin remains the biggest single cause of poisoning. Increased efforts are required in key areas including electrification, parental education and clarity on the management of paraffin ingestion, e.g. establishment of the efficacy of prophylactic antibiotics in paraffin-associated pneumonitis. Household cleaning product exposures are common in developed and developing countries. Low socioeconomic status is a risk factor for exposure due to lack of education, poor parental supervision and small homes with inadequate and unsafe storage facilities. Many exposures cause only minor symptoms, if any, and do not require medical intervention. Corrosive substances such as bleach, acids and alkalis cause more severe outcomes, although one study showed that bleach exposure did not increase the odds of hospitalisation.4 Our study corroborates these global trends and the need for increased preventive initiatives. Enormous changes in South African society must be taken into account in identifying steps to reduce the incidence and morbidity of childhood poisoning. The differences in the suburban distribution of particular toxin groups, particularly paraffin, pesticides and drugs, appear to reflect the socioeconomic status of these communities. For example, during the study Khayelitsha had 275 paraffin and 91 pesticides incidents and Mitchell's Plain had 20 paraffin and 31 pesticides incidents. In the 2001 Population Census,22 both had paediatric populations (0 - 14 years) of 30%, but their socioeconomic profiles differed markedly. Khayelitsha had 72% of households with an income of less than R1 600 per month, 51% unemployment and 57% living in a shack in an informal settlement. Mitchell's Plain had 35% of households with an income of less than R1 600 per month, 30% unemployment and 6% living in a shack in an informal settlement. These suburban differences provide the opportunity for targeted educational programmes and application of preventive measures such as child-resistant caps, but most importantly, advocate for enhanced socioeconomic development. With many children experiencing only minor exposures, PCCs can provide adequate telephone guidance on home management, thereby reducing hospital presentations and admissions, reducing costs and improving outcomes.3,6 The hazard factor,6 which incorporates an agent's toxicity, its packaging, availability in the home, severity of prior presentations, etc., is a rational approach to the poisoned child, and aims to prevent unnecessary presentations to hospital and focus efforts on those with a high hazard potential. Poignantly, both hydrocarbons and pesticides have high hazard factors. Our study limitations include that it is a retrospective review. The usual bimodal age distribution of paediatric exposures and poisonings is not a feature of these data, most likely explained by the cut-off age for management at RCWMCH as 13 years. The recategorisation of the 2008 figures to suit comparison with the 1987 data may have resulted in slight differences in the type of data presented, particularly regarding multiple-toxin incidents. Despite being unable to calculate the true incidence of paediatric exposures and poisonings, this study highlights the key areas of concern regarding the trends of causative agents and associated morbidity and mortality in children presenting to RCWMCH. Such data require acknowledgement by the South African National Department of Health, giving impetus to the conceptualisation of PCC support for the whole country, a concept paramount to providing care for a growing paediatric population.